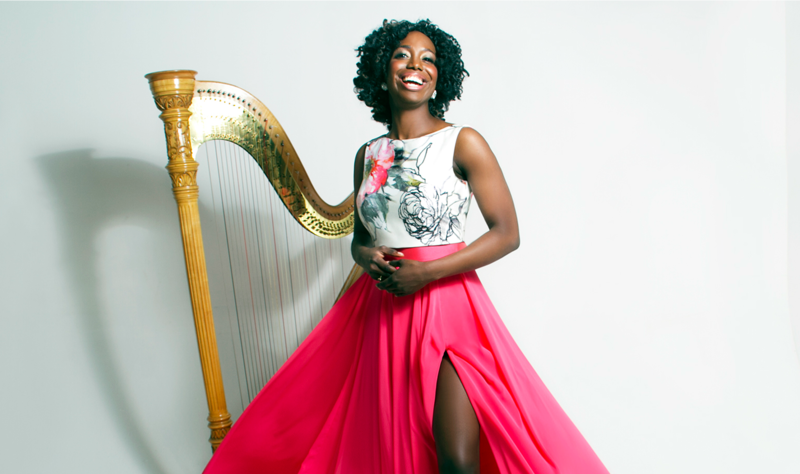 As her music explores classical, pop, jazz and hip-hop, harpist Brandee Younger classifies herself as simply a contemporary musician. Younger will perform at Lyon & Healy Hall on June 7 and at Hyde Park Jazz Festival on Sept. 29. RedEye chatted with the harpist about her high-profile collaborations and why the stringed instrument is in such demand. A: Most recently has really been a lot of Alice Coltrane’s work because it was the 10th anniversary of her passing. I played at her memorial in New York in 2007. The song that drew me to her immediately was “Blue Nile” because she was playing glissandi but literally through the blues. I had never heard the harp do that before. It was the most beautiful thing that I had ever heard. I was very young. This was before college. I’m also on (Chicago drummer) Makaya McCraven’s upcoming album. I’m excited to peform at Lyon & Healy Hall because I’ve been using their harps since I started playing. Q: What role do collaborations play in your music? That was a big lesson for me. Moving forward, each recording session, I had to get sharper with using my instincts. I was able to work with Common and John Legend, all these incredible people. When Moses Sumney came along, I had no idea his record would take off the way it did. I loved the song “Quarrel” that I recorded. Then I heard the rest of his music and I was like, “Oh my god, this is beautiful.” There was one show at Music Hall of Williamsburg. Up to that point, I had been playing and going backstage, but I came out in the audience. He had all of these tough, insecure New Yorkers singing. It was the most beautiful and vulnerable and so not New York thing I had ever seen. Q: How do you fit into the history of harp in popular music? A: Sampling has always been a thing, and at least from when it began, people have loved harp. Pete Rock was probably the first to start sampling harp with Dorothy Ashby. Madlib, J Dilla, all of these wonderful producers sampled Ashby, specifically. A lot of producers, especially the producers that are musicians, wanted live musicians in the studio. A lot of producers would try to use harp, but they were unable to articulate what they wanted. I spent a lot of time trying to be as flexible as possible, which has helped a great deal in terms of pop recording and anything that’s not classical. Q-and-As are edited for length and clarity.